Important questions about the impacts of the National Disability Insurance Scheme (NDIS) upon Aboriginal and Torres Strait Islander people will be addressed during a conference hosted in NSW this week by the First Peoples Disability Network Australia. Writer Karen Wyld is covering the event for the Croakey Conference News Service, and previews the discussions below. As many Australians prepare for the rollout of the National Disability Insurance Scheme (NDIS), some are asking: will it fit our way of living? For Aboriginal and/or Torres Strait Islander people living with disability and their carers, this is a much-needed conversation. First Peoples Disability Network Australia (FPDN) and affiliated state/territories peak bodies are assisting Aboriginal and Torres Strait Islander people to be NDIS-ready. They’ve been leading the way on advocating, and engaging with NDIS and key support services, and flagging the need for more opportunities for First Peoples’ input. FPDN is well equipped to lead and/or facilitate these discussions. What is unique about FPDN is that it’s not only a national peak body of the leading experts in the sector, but it’s governed by Aboriginal and/or Torres Strait Islander people with lived experience of disability. FPDN estimates 60,000 Aboriginal and/or Torres Strait Islander people will potentially be eligible for NDIS. Whilst there might be new opportunities for First Peoples through the NDIS, such as a growth in Aboriginal and/or Torres Strait Islander health and disability services workforce, valid concerns are being raised. Some of these include how effective NDIS rollout will be in rural and remote Aboriginal and Torres Strait Islander communities, and concerns of eligibility criteria not being inclusive or culturally relevant for First Peoples living with disabilities. Research and evidence-based advocacy are key roles of FPDN. In February 2016, they released a paper that highlighted the Intersectional Dimensions on the Right to Health for Indigenous Peoples – A Disability Perspective. How Indigenous people view ‘right to health’. The intersectionality of right to health, from the perspective of Aboriginal and/or Torres Strait Islander people living with disability. Discrimination as a barrier in securing the right to health. Institutional racism and ableism in health service delivery. Deterioration of rights across the life course of an Indigenous person living with disability. These themes and other vital messages from people with lived experiences will feature across the two and a half days of the FPDN Conference. Held on Wiradjuri country, the theme of the First Peoples Disability Network’s 2017 conference is Living Our Way. 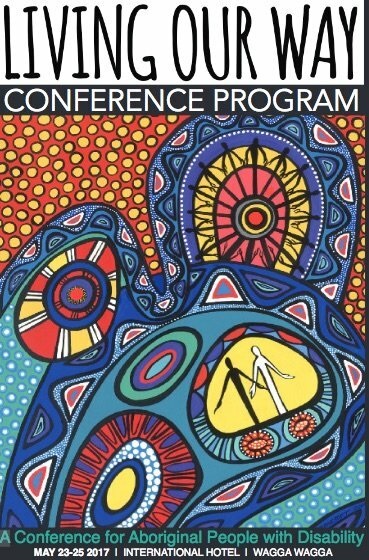 Between 23 to 25 May, Aboriginal and/or Torres Strait Islander people living with disabilities, their careers, and Aboriginal and Torres Strait Islander disability peak bodies and other services, will gather at the International Hotel in Wagga Wagga. Events occur daily that have an impact on individuals, their families and communities. This is where the need for support enters. This image encapsulates the essence of life that ‘every journey counts’. When you are creating your own journey, you are in control of your life and destiny. Your creation is your Amour, your shield, protecting the honour of life. The Aboriginal Disability Network is a community within a community, where Aboriginal and Non-Aboriginal people work tirelessly to assist those that are in need. The Rainbow Serpent created this great country and as all the rivers connect over the country, that is how the Network works, like views pumping life, giving nourishment to those of us what have disabilities. On the first day, conference attendees will be welcomed by Aunty Clorine Lyons, a local Elder. The keynote speech will be presented by Mr Alistair McEwin, Disability Discrimination Commissioner, Australian Human Rights Commission. It’s been almost a year since McEwin began in this role, so it will be interesting to hear his prospective of Australian’s acceptance and understanding of the rights of people living with disabilities. Jillian Paull, Branch Manager with the National Disability Insurance Agency, will speak about the rollout of the NDIS. This will most probably be a session that many of the conference participants are keen to attend; no doubt prepared to ask many questions and share their reflections based on lived experience. With its interactive approach, The Proper Way Planning Book, developed by Paul Calcott, will be an interesting session. Paul is the National Operations Manager at FPDN, and brings to his work a knowledge based on his experiences as an Aboriginal man (Wiradjuri) living with a disability. Day one will also have breakout sessions in the afternoon, with three topics for participants to choose from: NDIS Planning (Dianne Brookes, FPDN), Rights – Speak Up (Ombudsman Christine Regan & Carol Berry), and A Good Life – My Choice Matters (Annamarie Reyes). The second day kicks off with research and planning, and then moves into hearing about community programs. Scott Avery, Policy and Research Director FPND, will talk about Collating the Narratives of Aboriginal People with Disability. Followed by Dean Bright, Senior Manager with Intereach, talking about planning for the NDIS. Rochelle Pitt and Melicha Woodcock will talk about a Portable Dialysis Program in Queensland. And Tom Powell will talk about how his organisation, Red Dust Healing, contributes to Keeping Safe within Cultural and Your Mob. At the Conference Dinner, people will have time to yarn about the conference, while being entertained by the Col Hardy Band. The Redfern Statement video will also be screened. With its theme of We Have the Solutions, it fits well with the FPDN conference theme of Living Our Way. On the final day of the conference, guest speakers include Suzanne Donnelly and Hayley Robbins from Autism Spectrum Australia (ASPECT), and Emma Bedwin and Jenny Beath from the Department of Fair Trading NSW. Jake Briggs, a Kamillaroi/Wonnarua man living with a disability, will talk about pathways to careers and training. Then Jake will be joined by Ben Riemer from FPDN for the final session, which is focused on Koori Court. Finishing at lunch time, the attendees will be able to share their reflections of the conference, and do some final networking. The 2017 First Peoples Disability Network Conference is sure to be of interest to many. 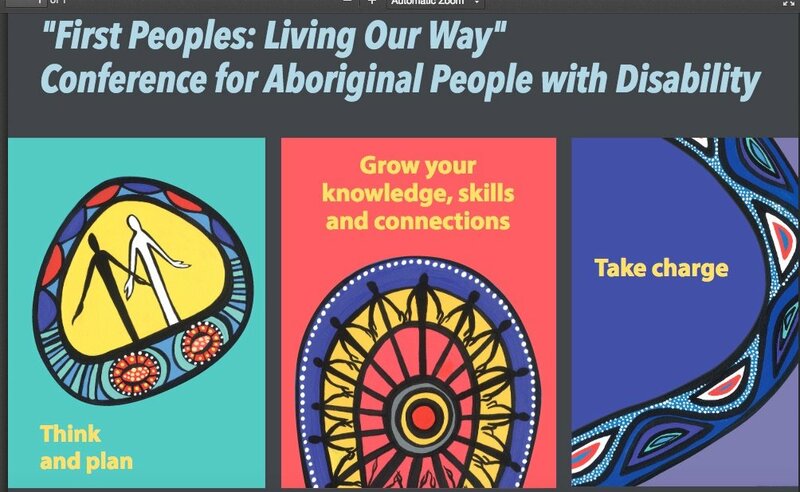 With its focus on Living Our Way, and strong representation from Aboriginal and/or Torres Strait Islander people living with disabilities, the FPDN conference will be culturally relevant, informative, and solutions-driven. And, as always the case when Aboriginal and Torres Strait Islander people gather to share their knowledge and experiences, the room is sure to be full of acceptance, good yarns and a few laughs. Join in the conversation at: #LivingOurWay and on Facebook. • Karen Wyld is a freelance writer and consultant based in South Australia, with a background in Aboriginal health, research, community development and health workforce training (You can support her writing here). New knee osteoarthritis standards & why not everyone needs inpatient rehab after a knee replacement. But who decides? Too much medicine; not enough (quality) media?